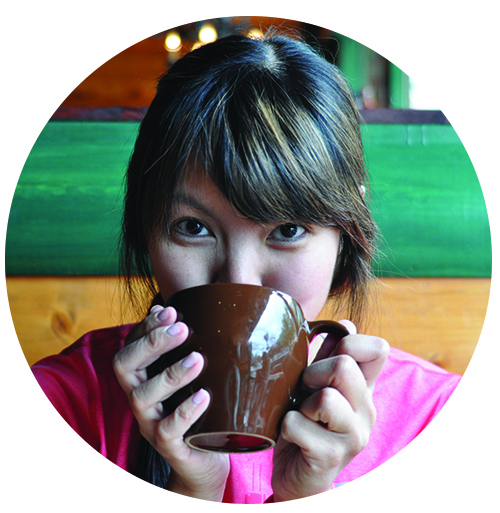 I originally tried to eat at Bite Mi during Christmas break around campus but they closed down. I guess that makes sense for a restaurant located on campus. Last week, I went to my favorite Vietnamese sandwich (banh mi) place, Cafe de Bella, only to be disappointed that they closed down! 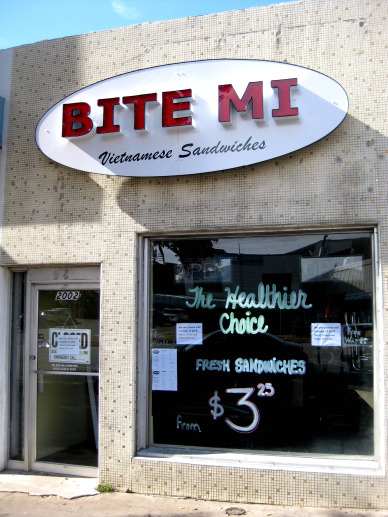 That augmented my craving and I was once again reminded of the new-ish banh mi and only banh mi place on campus, Bite Mi (get it?). It’s a tiny hole in the wall, Bite Mi. 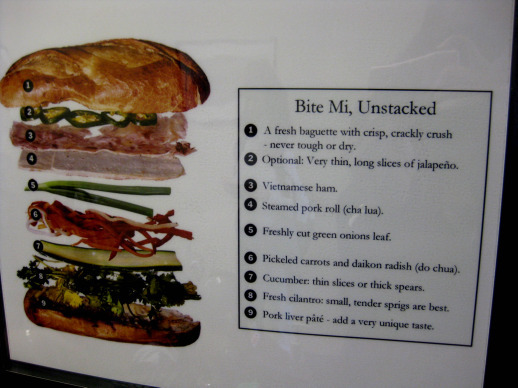 You order before you sit and there’s a lovely sign that explains what a banh mi dac biet is (combination sandwich). The only discrepancy I noticed about this sign and my experience of banh mi’s is I’ve never had a banh mi dac biet with green onions in it. I’m not a fan of raw any kind of onions and missed that theirs had green onions in it. Yuck, it was an unpleasant surprise for me. The lady who took my order is really sweet and friendly. She fingered the pendant I was wearing and her familiarity was disarming but I wasn’t too bothered by it. I just interpreted as friendliness. 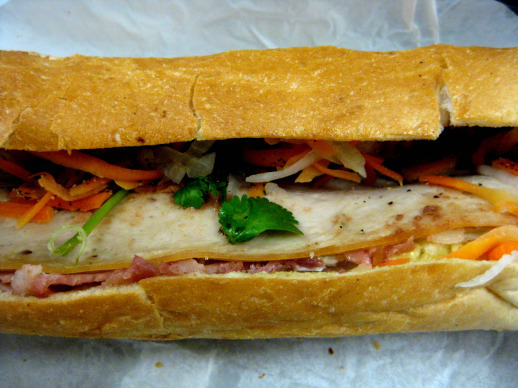 There’s only one person making the sandwiches and oh my, I think I waited a good 20 minutes for my banh mi. Already, this won’t be a place I’d frequent during work hours due to the wait. I got the sandwich to go and ate it infront of my computer. The sandwich was not that great. Bread wasn’t as nicely toasted as I would like. The ingredients just didn’t do it for me and I couldn’t really place a finger on why. 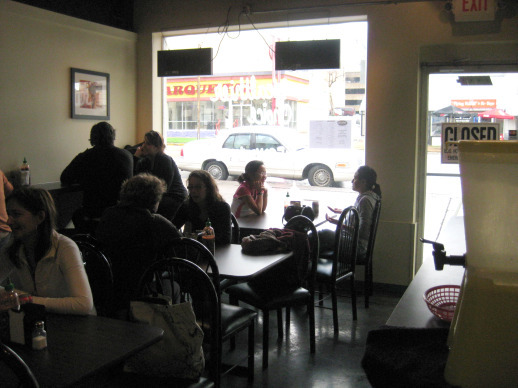 It made me really miss Cafe De Bella’s banh mi and lament its closing. However, it wasn’t awful and being as it’s the only Vietnamese sandwich shop on campus, I can imagine myself coming back to Bite Mi if I have a craving I couldn’t deny while at work.